What to make of VIC + FLO SAW A BEAR? One third dark comedy, one third doomed love story, one third surreal tone-bending denoument, it's a movie‎ that's hard to put your finger on, and so languidly paced that I'm not sure you'd find a pulse if you did. It's the story of two ex con lovers who live in rural Canada. The elder, Victoria (Pierette Robitaille), is pugnacious and no-nonsense. She incurs the wrath of her weird neighbours for apparently neglecting her invalid father. The younger, Florence (Romaine Bohringer), ‎has genuine affection for Vic, but wants to be part of the real world too. All of this is observed and mediated by their sympathetic parole officer - a man they mock but who is the only one who really cares. There's much to like in the film. The charismatic dual lead performances. The genuine empathy one has for this odd couple. The Wes Anderson like deliberate framing of director Denis Côte and the willingness to use abrupt changes of tone. In particular I was intrigued by the butch gardener, Jackie, and how Cote chose to film her. And after seeing the final act, she is surely one of the most bizarrely frightening characters since Javier Bardem in NO COUNTRY FOR OLD MEN. But ultimately, VIC + FLO was so odd it just slipped out of my fingers, and remains a mere collection of body parts. I am somewhat surprised that it win the Silver Bear at Berlin. VIC + FLO SAW A BEAR has a running time of 95 minutes. 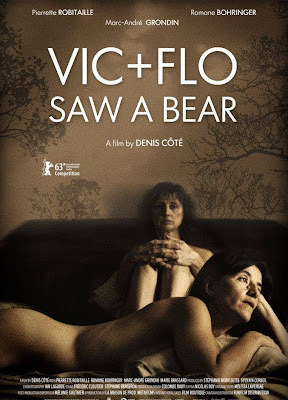 VIC + FLO SAW A BEAR played Berlin 2013 where Denis Cote won the Silver Bear, as well as Sydney and London. It opened earlier this year in France.